Don't let taxes stress you out! Check out these deals and freebies. After you've finished your taxes, celebrate with some freebies. Several businesses are offering deals on April 15 to help take the stress out of Tax Day. Get the $10.40 Tax Day meal special. 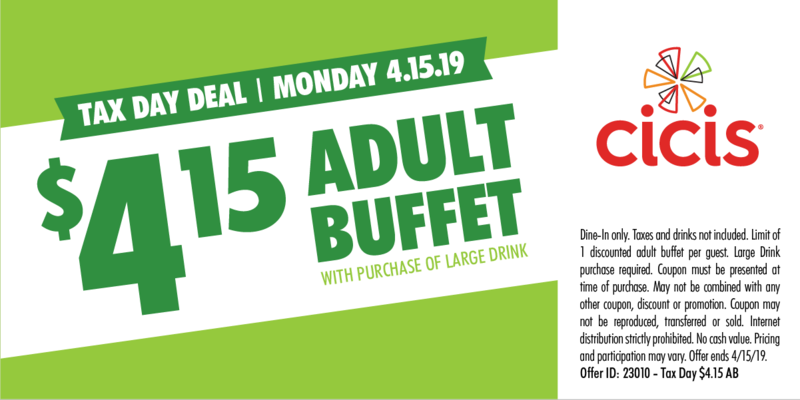 Get an adult buffet for $4.15 with a purchase of a large drink. Dine-in only. Shred up to five pounds of documents for free with a coupon. This offer lasts through April 27. From tax to relax, Planet Fitness is offering free hydromassages from April 11-20. You just need to bring a coupon, available on their website. You don't have to be a member to enjoy it. Sign up for Potbelly Perks online or by downloading the restaurant's app to get a free sandwich. If you're already enrolled, you'll get a BOGO sandwich that will load in the app for you to redeem on Tax Day. The shop is offering a free small The Original sandwich if you buy chips and a medium drink on Tax Day only.